Hirotoshi Takeda, Management Information Systems, Laval University, Quebec, QC, Canada. Robert Sainsbury, GravityJack Software, Liberty Lake, WA, United States. This study looks a small to medium sized online community (OC) and tries to identify ways to measure impact of the contributions of the users of the OC. Online communities are dependent on contributions of their users to maintain the health of the OC. Measuring the health of an OC by identifying those users that have most influence and thus create more activity and finally more people the visit the OC is an important activity to the stakeholders in the OC. In order to measure these high end users we are extending previous research to include a two part measure. First, using the Hirsch metrics to measure the productivity and impact of user contributions and second, using social network analysis to see those users that have high centrality measures in the network of posters and readers of the OC. This study looks at one University sports fan site to measure the influence of their users and found some correlation between the Hirsch measures and the centrality measures. Hirotoshi Takeda, Michael Cuellar, Brett Young and Robert Sainsbury. 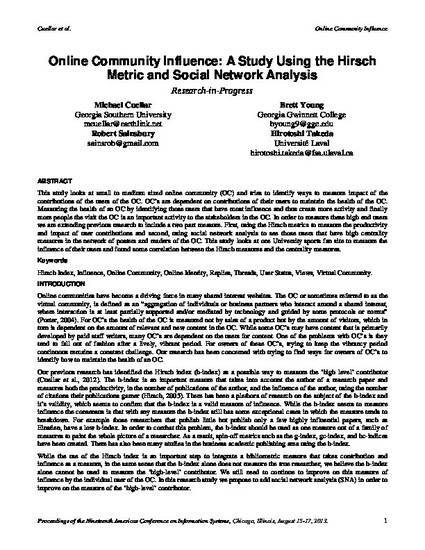 "Online Community Influence: A Study Using the Hirsch Metric and Social Network Analysis"